PS Vita version due out late next month. Koei Tecmo and Omega Force have detailed the features of the PS Vita version of Dynasty Warriors 8: Empires, coming west via the PlayStation Store on November 24 in North America and November 25 in Europe. Players will be able to enjoy exhilarating Warriors action on the go, using new intuitive touchscreen controls for actions such as calling their faithful steed or activating the powerful ‘Rage’ state! The touchscreen can also be used to select and activate Stratagems, Dynasty Warriors 8’s special skills cards collection, allowing the player faster and more accurate control of the battlefield. Since even the most powerful Warriors might need a helping hand, Dynasty Warriors 8: Empires encourages two-player ad hoc cooperative multiplayer, allowing nearby friends to join together and try to survive the fierce battles of ‘Empire Mode’, or overcome the challenging scenarios in ‘Free Mode’. 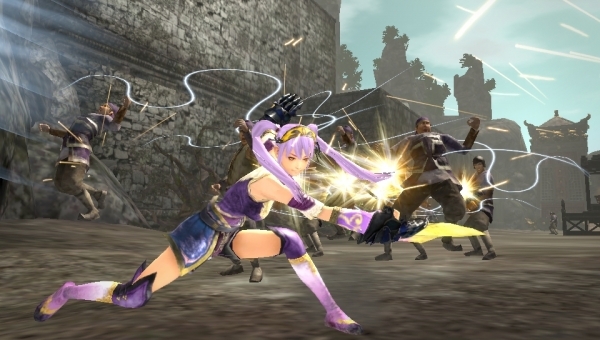 Dynasty Warriors 8: Empires is compatible with PlayStation TV, meaning gamers can enjoy the game on large screens. For those already in possession of the PlayStation 3 and PlayStation 4 versions, Cross-Save and Cross-Play functionality is enabled across all versions, and content downloaded for the PlayStation 3 and PlayStation 4 can be downloaded on the PS Vita version free of charge. Koei Tecmo announced downloadable early-purchase bonus content, available to those who pre-purchase the game via the PlayStation Network within first month from release! Specifically, this ‘Special Edit Parts’ pack, includes equipment and costumes based on fan favorite Koei Tecmo characters: Guo Jia and Guan Yinping from Dynasty Warriors 8, Date Mashamune from the (Japan-only) social game Nobunyaga no Yabou, and a very special Tenko costume from the sensational demon-hunting action title Toukiden!